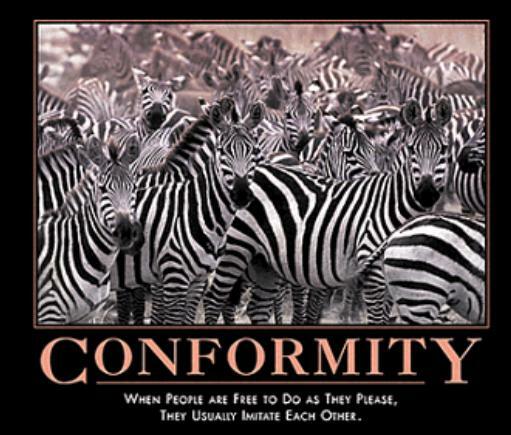 For a place that prides itself in it's history of rebellion, I have never been anywhere that demands more conformity. In the South, rebellion is not permitted, at least not within the social construct. Rebellion outside of the culture is acceptable; the Tea Party is praised for it's "rebellion" against the Federal Government. But within the bounds of Southern society, even mild non-conformity is treated far more harshly than elsewhere. This seeming inconsistency has bothered me for a long time; why is the South so caught up in obedience and bowing to the internal power structure, while building an entire identity around refusal to bow to an external power structure? Then I realized, the South is nothing but a group of Goth teenagers. It all comes back to an identity of shared persecution. Both Southerners and Goths feel like no one understands them, that they are being persecuted by the tyrannical "other," whether it is the Federal Government or parents and school systems. And this very persecution gives them their sense of identity, and it strengthens the social bonds within the group. Things like the Confederate Flag and black eyeliner become the rallying points of a culture under attack. I have written two blog posts on how Southern Culture feels like it is under attack, so I won't cover old ground here, but the naturalized culture of the South is under what is perceived to be an attack. And like a group of Goths, Southerners cling to identity markers and a tight knit social structure. The adversity of persecution reinforces the social compact, and makes that compact even more essential. It should be noted that neither the South nor the Goth are actually mistreated for the most part, it is a perception that is actually part of the identity of the "outsider." It is a part of the construct. And that construct is a powerful thing; it is what gives that group their strength. It should be noted that actual persecution is different from illusionary persecution. Even though both typically reinforce cultural markers, actual persecution can also degrade culture if it is perceived as to dangerous to maintain that culture. The persecution of Southern culture is illusionary in that no one is actually in physical danger from their culture; the threat to their culture is rooted in epistimology. To return to the main point, when people feel like everyone is against them, their internal bonds get much stronger, because they feel like they have no one else. It creates a sense of "you and me against the world," which leads to an extremely tight society. Just like "Southern Nice," it becomes a bulwark against an existential threat. But it goes further than that. It becomes a method of internal control. When a group is under threat, there can be no internal dissention. Look at how a fractured America came together after Pearl Harbor or after September 11th. No matter what your political persuasion was, after those events, all other sub-categories disappeared, and the only identity of any importance was that of being an American. People, at their root, are herd animals. (We don't like to think of it that way, but all social animals revert back to group-think in times of stress or crisis.) As herd animals, our identity submerges into the collective identity at these times. This leads to the ability of the "alpha" to control the behavior of the rest of the group. You see it in the Goth sub-culture, and you see it in the South, with dynamic preachers or politicians. The leaders take this strong need to belong and use it to manipulate behavior, through the use of the Third Dimension of Power. They make people do what they want them to do, because people, especially people belonging to a persecuted group, cannot afford to lose the ties to their band. In essence, the leaders perpetuate the sense of persecution by the outside world to reinforce their internal control mechanism. And it is not just Southerners and Goths that this happens to. You see it in the Republican Party and in the Christian Churches. You see it in every ethic group with a strong cultural identity. Democrats wonder why the Republicans see themselves as an oppressed minority even when they run the entire show. Non-Christians don't understand the brouhaha over the "War on Christmas," when Christmas is the biggest holiday in America. People wonder why immigrants don't abandon their languages and their traditions now that they live in America. It has to do with this control, and this sense of identity through persecution. By setting themselves us as the oppressed, some Republicans and some Christians reinforce the internal bonds of their sub-cultures. It pulls them together, and supports their identities. It creates boundaries on the group's behavior and causes them to revert back to a herd mentality. It creates a cultural dynamism that creates an opportunity for the group to move as a cohesive whole. The basic core of this is, "I have no one else to turn to, so I must obey the rules to avoid being cast out of the one group that accepts me." Cultural identity is an important thing, and I am not trying to demean it here. This dynamic gives people a sense of safety and of belonging. What I am talking about is the deliberate set up of persecution to create identity within a group. In the end, setting yourself up as part of an outcast group becomes a self fulfilling prophecy.